A superb collection of reprinted ads, posters, memorabilia, articles, and photos providing an intimate look at America's home front. CBI - China: Day 92 of 142 of the 1st Battle of Hebei. Spain: Day 260 of 985 of the Spanish Civil War. UK: Britain grants recognition to the new Austrian government. Spain: Day 625 of 985 of the Spanish Civil War. CBI - China: Day 270 of 2,987 of the 2nd Sino-Japanese War. Day 55 of 124 of the Battle of Henan. Day 10 of 15 of the Battle of Taierzhuang. Day 10 of 39 of the Battle of Xuzhou. Eastern Front: Day 11 of 13 of the Slovak-Hungarian War, aka the Little War. For the most part, this war is over, but in some places the fighting will continue for another two days. CBI - China: Day 635 of 2,987 of the 2nd Sino-Japanese War. Day 17 of 54 of the Battle of Nanchang. Atlantic: Germans attack Scapa Flow and North Sea convoys. German sub U-38 sinks the Finnish steamer SIGNE, killing the entire crew of 19. ETO: Hitler gives orders for the invasion of Denmark and Norway to begin on 9 April 1940. For the first time, he tells his foreign minister about it so his office can make up an excuse for the invasion. CBI - China: Day 1,001 of 2,987 of the 2nd Sino-Japanese War. Day 140 of 381 of the Battle of South Guangxi. Day 66 of 67 of the Battle of Wuyuan. Atlantic: German sub U-48 sinks the British ship BEAVERDALE 300 miles southwest of Iceland. Atlantic: Eight German U-boats attack an Allied convoy 460 miles southwest of Iceland, sinking 6 merchant ships. Atlantic: Canadian armed merchant cruiser PRINCE HENRY intercepts two German merchant ships off the coast of Peru. Both German ships are scuttled by their own crews to prevent capture. ETO - UK: Day 209 of 258 of the Blitz. MTO - Greece: German bombers attack an Allied convoy 25 miles south of Crete sinking 2 freighters and damaging 2 others. MTO - Libya: The German 5th Light Division recaptures Agedabia and Zuetania. East Africa: Day 297 of 537 of Italy's East African campaign in the lands south of Egypt. British troops cut off the Italians retreating from Adigrat, Eritrea. Meanwhile in Abyssinia, the British 22nd East African Brigade reaches the Awash River. East Africa: In the Red Sea, Italian Rear Admiral Bonnetti refuses to surrender and orders his fleet to attack Port Sudan in British Sudan on a "do or die" mission. All of his destroyers will be sunk or captured without any real achievements. CBI - China: Day 1,366 of 2,987 of the 2nd Sino-Japanese War. Day 20 of 27 of the Battle of Shanggao. CBI - Thailand: Day 184 of 221 of the Franco-Thai War (Vichy France vs Thailand). Atlantic: Day 79 of 169 of Germany's Second "Happy Time," during which U-boats sink 609 Allied ships with little risk. Russian Front - North: Day 207 of 872 of the Siege of Leningrad. Russian Front - North: Day 54 of 102 of the Battle of the Demyansk Pocket, another failed attempt to break the siege at Leningrad. Russian Front - North: Day 70 of 103 of the Battle of the Kholm Pocket. Another attempt to break the siege at Leningrad. Russian Front - Center: Day 85 of 103 of the Battle of Vyazma, Russia. Russian Front - Center: Day 85 of 103 of the Battle of Sychevsk, Russia. Russian Front - Center: Day 31 of 49 of the Battle of Rzhev, Russia, a diversion to pull more German troops away from Moscow. Russian Front - South: Day 155 of 248 of the Siege of Sevastopol, Crimean Peninsula. MTO - Malta: The Axis air forces begin a bombing campaign against the British naval base at La Valetta. CBI: Day 3 of 11 of the Japanese Naval raids on Allied ships throughout the Indian Ocean. CBI - Burma: Day 110 of 164 of Japan's Invasion of Burma. British troops retreat from Prome in upper Burma. US 10th Air Force B-17s attack a Japanese convoy in the Andaman Islands off the south coast of Burma, damaging two ships. CBI - China: Day 1,731 of 2,987 of the 2nd Sino-Japanese War. PTO - Malaya: Day 43 of 357 of the Battle of Timor Island. PTO - Philippines: Day 116 of 152 of the 1st Battle of the Philippines. 5th Air Force provides air support. Atlantic: HMS BLACK SWAN and HMS STONECROP sink German sub U-124 in the Atlantic Ocean. Russian Front - North: Day 572 of 872 of the Siege of Leningrad. Russian Front - North: Day 333 of 658 of the Siege of the Kholm Pocket. MTO - Italy: US 9th Air Force RAF Liberators night bomb at Messina and Crotone. During the day, US B-24s bomb Messina and Crotone again and also at Villa San Giovanni, Naples and Augusta. MTO - Tunisia: Day 137 of 178 of the Battle of Tunisia. RAF and US Air Forces provide Allied air support. Day 11 of 16 of the Battle of El Guettar. US 9th ID is moved to attack Hill 772, leaving the US 1st ID to take Hill 369 by themselves. CBI - Burma: Day 103 of 104 of the 1st Battle of Arakan. The British call off this failed offensive campaign and begin withdrawing. CBI - Burma: Day 54 of 79 of the Allied Operation LONGCLOTH. US 10th Air Force provides air support. CBI - China: Day 2,096 of 2,987 of the 2nd Sino-Japanese War. PTO - Alaska: Day 300 of 435 of the Battle of Kiska, Aleutian Islands. US 11th Air Force attacks targets on Kiska Island, hitting North Head, the Main Camp and the submarine base. Other B-24s bomb the runway at Attu. PTO - Caroline Islands: The USS TUNNY torpedoes the Japanese transport TOYO MARU II off Alet Island. PTO - New Guinea: US 5th Air Force hits the Kitchen Creek area, the Labiabi-Duali area, Salamaua, Finschhafen, the bridge at Rempi, and airfields at Gasmata and Cape Gloucester. PTO - Solomon Islands: Day 2 of 16 of Japan's Operation I-GO. US 13th Air Force planes attack and set fire to a small cargo vessel in Kokolope Bay. ETO - Belgium: Troops of the German 12th SS Panzer Division massacre 86 Belgians in retaliation for the recent bombing of their train by local resistance fighters. Russian Front - North: Day 61 of 191 of the Battle of the Narva Isthmus, Estonia. Both German and Soviet troops in the Baltic region remain in a defensive position. Russian Front - South: Day 101 of 113 of the USSR's Dnieper-Carpathian Offensive in southwestern Ukraine. Russian Front - South: Day 30 of 45 of the Battle of Chernovtsy, Ukraine. Russian Front - South: Day 9 of 15 of the Battle of Kamenets-Podolsky Pocket, Ukraine. Russian Front - South: Day 28 of 44 of the Battle of Snigirevka, Ukraine. Russian Front - South: Day 8 of 20 of the Battle of Odessa, Ukraine. Eastern Front - South: Soviet troops enter Romania, liberating Gerca. The USSR tells the trapped German 1st Panzer Army that if they refuse to surrender, then they will shoot one-third of the recently captured POWs. MTO: US 15th Air Force B-24s and B-17s attack targets in Austria and Yugoslavia. MTO - Italy: Day 77 of 123 of the Battle of Monte Cassino. RAF and US Air Forces provide air support. MTO - Italy: Day 72 of 136 of the Battle of Anzio. RAF and US Air Forces provide air support. CBI: US 14th Air Force: B-24s on a sea sweep from Hong Kong to Formosa sink a ship and damage a large motor launch. CBI - Burma: Day 95 of 99 of the 2nd Battle of Arakan. CBI - Burma: Day 29 of 166 of the UK's Operation THURSDAY. CBI - Burma: Day 24 of 147 of the Battle of Myitkyina. US 10th Air Force provides air support. Day 6 of 10 of an action at Nhpum Ga Ridge by the infamous "Merrill's Marauders" against 1,300 Japanese. CBI - Burma: Day 2 of 302 of the Chinese Salween Offensive. CBI - China: Day 2,462 of 2,987 of the 2nd Sino-Japanese War. CBI - India: Day 26 of 118 of the Battle of Imphal-Kohima. PTO - Caroline Islands: US 7th and 13th Air Forces attack targets at Truk. PTO - New Guinea: Day 34 of 80 of the Battle of the Admiralty Islands. 5th Air Force provides air support. PTO - New Guinea: Day 197 of 219 of the Battle of Shaggy Ridge. 5th Air Force provides air support. PTO - New Guinea: Day 110 of 597 of the Battle of New Britain. US 13th Air Force provides air support. PTO - Solomon Islands: Day 154 of 295 of the Battle of the Bougainville Islands. US 13th Air Force provides air support. ETO - France: Day 247 of 284 of the Battle of Brittany. ETO - France: Day 200 of 236 of the Siege of Dunkirk. ETO - Germany: Day 28 of 46 of the Battle of the Ruhr Pocket. The British 7th Armoured Division enters Rhine on Dortmund-Ems canal, 60 miles northeast of Essen. US 9th Air Force provides air support. ETO - Germany: Day 2 of 4 of the Battle of Kassel. Russian Front - Finland: Day 200 of 223 of the Lapland War. Finland and Russia have joined forces to kick the Germans out of Finland's most northern province. Russian Front - Center: Day 170 of 206 of the Battle of the Courland Pocket in Latvia. Russian Front - Center: Day 68 of 75 of the Battle of Königsberg, East Prussia (now Kaliningrad, Russia). Day 2 of a 6-day Soviet artillery bombardment against Königsberg. Russian Front - Center: Day 52 of 54 of the Battle of East Pomerania, Germany. Russian Front - Center: Day 49 of 83 of the German Siege of Breslau (today Wroclaw, Poland). The Soviets lay siege. Russian Front - South: Day 8 of 21 of the Battle of Nagykanizsa-Körmend, western Hungary. The Soviets capture the oil production at Nagykanizsa and the industrial zone of Mosonmagyarovar. Russian Front - South: Day 21 of 34 of the Battle of Vienna, Austria. Soviet troops capture Wiener Neustadt, Neunkirchen and Gloggnitz. MTO: US 15th Air Force B-24s and B-17s bomb targets in Austria and Yugoslavia. CBI - Burma: Day 58 of 99 of the Battle of Pakokku and Irrawaddy River operations in central Burma. The US 10th Air Force provides air support. CBI - China: Day 2,827 of 2,987 of the 2nd Sino-Japanese War. Day 2 of 91 of the Battle of Zhijiang. US 14th Air Force provides air support. PTO: US 7th Air Force B-24s bomb Marcus Island in the north Pacific. PTO - Japan: US 20th Air Force B-29s bomb the Nakajima aircraft factory at Tokyo. PTO - Japan: Day 2 of 83 of the Battle of Okinawa. PTO - New Guinea: Day 462 of 597 of the Battle of New Britain. US 10th Air Force provides air support. PTO - New Guinea: Day 346 of 481 of the Battle of Western New Guinea. US 10th Air Force provides air support. PTO - Philippines: Day 165 of 299 of the 2nd Battle of the Philippines, aka the Liberation of the Philippines or the Philippines Campaign. PTO - Philippines: Day 109 of 244 of the Battle of Luzon. 5th Air Force provides air support. US troops land on Sanga Sanga, Sulu, without resistance as Filipino guerrilla fighters had already secured the island prior to the landing. PTO - Philippines: Day 24 of 159 of the Battle of Mindanao Island. 5th Air Force provides air support. PTO - Philippines: Day 16 of 135 of the Battle of the Visayas region. 5th Air Force provides air support. Poland: Nazi war criminal Rudolf Höss is sentenced to death in Warsaw by the Supreme National Tribunal. He was the first commandant of the infamous Auschwitz concentration camp, having developed mass extermination techniques previously in Dachau and Sachsenhausen. 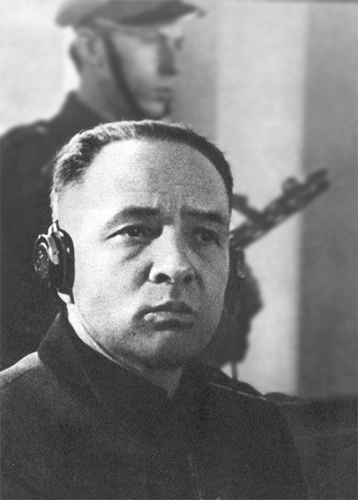 During his trial in Poland by the Supreme National Tribunal, when accused of murdering three and a half million people, Höss replied, "No. Only two and one half million - the rest died from disease and starvation." He was executed by hanging on 16 Apr 47 next to the crematorium of the Auschwitz I concentration camp where he had been Kommandant. History's greatest mass murderer personally supervised the extermination of approximately two million people at the death camp at Auschwitz. The tragic story of patriotic American Iva Toguri, wrongly tried and convicted of treason against the American people for her supposed role as the legendary "Tokyo Rose." Roosevelt, Churchill and Chiang Kai-Shek met in Cairo, 22-27 Nov 1943, to discuss the future of the war in the China-Burma-India Theater and postwar plans after Japan's defeat.